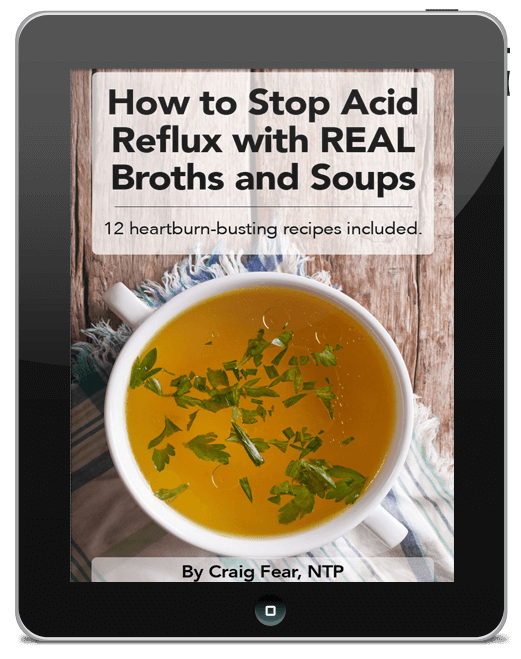 Instead of Napa cabbage, use bok choy. OK, that’s a wrap. Thanks for stopping by my blog. Good night everyone! All joking aside, it really is that simple to make bok choy kimchi. Of course, if you’ve never made kimchi before, it’s not that simple. So I’m here to help! Kimchi is my absolute FAVORITE fermented food and this summer I intend on making kimchi everything from my vegetable CSA – radish kimchi, carrot kimchi, root vegetable kimchi and of course, good old-fashioned regular kimchi. 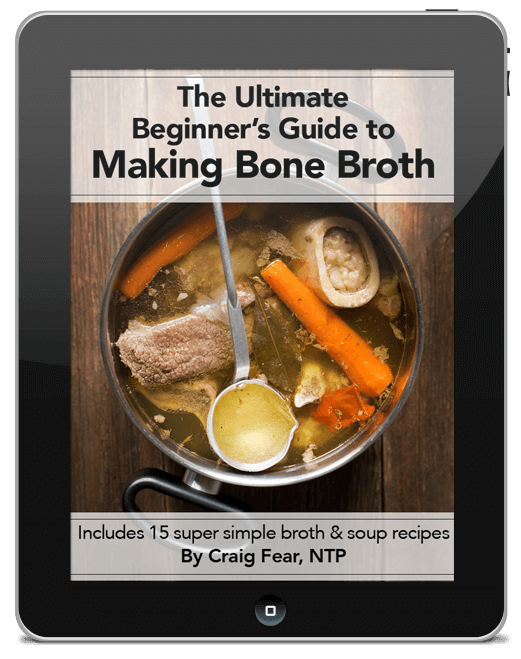 But the most basic variation of all is to use bok choy instead of the more traditional Napa cabbage. 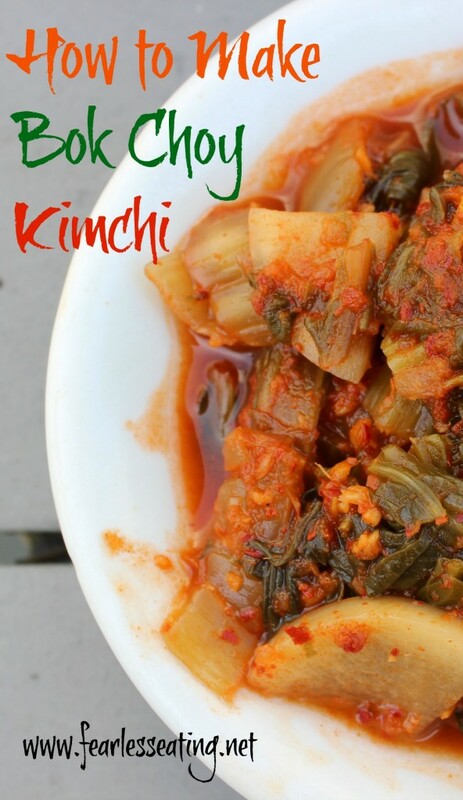 Bok choy kimchi simply uses bok choy instead of the more traditional Napa cabbage. This simple recipe shows you how to do it. 1/4 - 1/3 cup Korean red chili powder Add more or less depending on how spicy you like it. 1/3 cup is just about right for my tastes which is fairly spicy. Trim bottom of bok choy and chop. Chop the daikon radish and scallions as well. Add the salt to the vegetables and mix thoroughly. Crush and squeeze the veggies with your hands. Do this for a minute or two until the veggies get nice and wet from the water that is released. In a food processor, blend the garlic, ginger and chili flakes. Add a little water if needed to create more of a paste. Thoroughly mix the cabbage, radish, scallions and optional fish sauce with the paste in a bowl. Pack mixture into glass mason jars with some sort of kitchen tool with a blunted end. Check out this wooden pounder tool which is more specific to fermenting vegetables. Press mixture firmly into jars until the water level starts rising. Put the lids on and leave the jars at room temperature for 3-7 days. Open the lids every day to release the carbon dioxide that form as a byproduct of fermentation. If the water level rises, drain some off. If the vegetables rise above the level of the water, pack them back under the water. Taste the bok choy kimchi after 3 days. It should taste pleasantly sour. If not, continue to let it ferment and taste it every day until you find the taste acceptable. Transfer to the fridge where it will continue to ferment (and the taste will change!) albeit at a much slower pace. It will last for at least six months. Want even more creative ways to make kimchi? 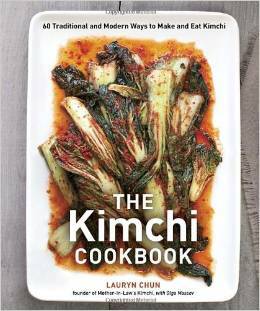 Check out the The Kimchi Cookbook: 60 Traditional and Modern Ways to Make and Eat Kimchi. Have you ever made kimchi with bok choy? Or maybe even with different veggies? Or even fruit? I’d love to hear about your kimchi-making adventures!